Israeli police and rescue teams are searching for a Northern Ireland man who has been missing for several weeks in the southern Israeli desert. Oliver McAfee, from County Down, was last seen on 21 November, police said. The 29-year-old had been cycling on the Israel National Trail near the desert city of Mitzpe Ramon. Travellers found his wallet, keys and a a tablet computer on the trail and handed them in to police, prompting a search that is ongoing after 11 days. He had given up his gardening job in Essex in April to cycle across Europe and had cycled about 14,000 km (8,700 miles) on what friends described as a voyage of personal discovery. Mr McAfee's family contacted Israeli police about his disappearance in late December. Since then, a police search involving helicopters, bloodhounds and desert search teams has proved fruitless. Friends of Mr McAfee have launched a Facebook page to try and find him. In a post, they said that he had been due to leave Israel at the beginning of December. "As time passed without contact, we became concerned that we hadn't heard from him and started reaching out to people he had stayed with in the past and friends in Israel," they posted. 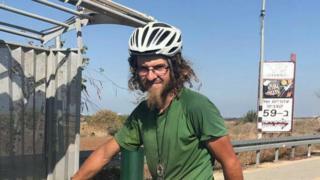 "We know that he has not left Israel as his passport has not crossed a border, but some of his possessions, a tablet computer, his wallet and keys, were found near a trail in a park in southern Israel, and further possessions, his bike, other bags, shoes and so on, were found near an apparent camp site further away. "The Israeli authorities are now working with Interpol and the UK Foreign Office to try and locate Ollie, and have started a media campaign in Israel to try and find him."